Lock in a great price for Knowles House B&B - Adult Only – rated 9.2 by recent guests! The location was perfect and being close to the free Duval Loop bus service an added bonus. The staff was so helpful. Breakfasts were delicious and different daily. Great breakfast and wonderful staff. Location could not have been better -- 2 blocks from ferry terminal and boardwalk. The staff was great, the room was great, we got a good nights sleep, it was quiet. Breakfast was better than we expected. I would recommend this B&B to anyone. The staff were wonderful and very accommodating with what we needed outside of our room expectations. The location was ideal for everything to experience in Key West. Breakfast was an added bonus to wake up to in the mornings. Breakfast was delicious and location was great. Staff was very welcoming. There was a dipping pool and outdoor shower that was safe and private. The location was very good. Great location. Comfortable spacious room. Complimentary wine and beer late afternoon. Knowles House B&B - Adult Only This rating is a reflection of how the property compares to the industry standard when it comes to price, facilities and services available. It's based on a self-evaluation by the property. Use this rating to help choose your stay! This adult-only, restored 1800’s conch house in Key West features a rooftop sundeck. It is only 5 blocks from Duval Street and each room is uniquely decorated and includes a fridge. 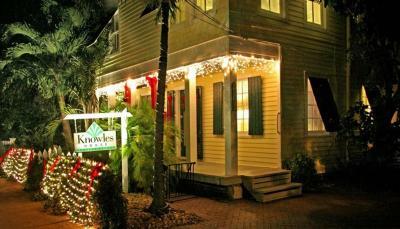 Mallory Square and the Sunset Celebration is a 17-minute walk from the Knowles House B&B. The ferry terminal to Ft. Myers and Marco Island is 2 blocks away. Each room features bright accents and a different theme at the Knowles House Bed & Breakfast Key West. All rooms provide a private bathroom with toiletries. Free WiFi and cable TV are included. This tropical property features an outdoor pool and garden. The property also offers tour information for the surrounding area. This is our guests' favorite part of Key West, according to independent reviews. This property is also rated for the best value in Key West! Guests are getting more for their money when compared to other properties in this city. 뀐 Located in the top-rated area in Key West, this property has an excellent location score of 9.4! When would you like to stay at Knowles House B&B - Adult Only? Rooms may feature a country French, English Colonial, or tropical theme. A refrigerator and a flat-screen TV are also included. Featuring a unique theme, this room includes a refrigerator and flat-screen TV. This poolside room features antique furniture and decor. House Rules Knowles House B&B - Adult Only takes special requests – add in the next step! Knowles House B&amp;B - Adult Only accepts these cards and reserves the right to temporarily hold an amount prior to arrival. Knowles House B&B - Adult Only accepts these cards and reserves the right to temporarily hold an amount prior to arrival. Room was too small for two people. Free parking meant finding a non-residential spot in a nearby street.Breakfast is not available if you have to leave early. Lots of single guys. Breakfast on the patio was so peaceful! I love the friendly atmosphere and overall experience. The internet ran a little slow and the pillows were not to my liking. Can't think of a thing we didn't like, good job Knowles. I will start off with blaming my overall dissatisfaction with Booking.com and there deceptive practices. The room advertised is not the accommodations you will receive upon arrival and thus being why there is a no cancellation policy. The customer service is non-existent and conveniently based in the Netherlands. I believe the property's are aware of these practices and use this to there advantage. We were not shown our room prior to paying the balance owed for the stay. We were given the smallest room under the stairs and next to the main entrance of the house. Upon expressing dissatisfaction of our extremely small room to the hosts we were told this what you get as a result of purchasing the stay through Booking.com . They stated all the rooms were full and there was nothing further they could do for us. The house is from the 1800's and I understand this comes with limitations but certain things can be updated. The floor had multiple areas of decayed wood in the bathroom and bedroom areas. The room is extremely small with little to no area or surfaces to accommodate oneself and your luggage. Key West had become a very noisy and rowdy town as we found out throughout the day and night of our stay. With the room being under the stairs and next to the main entrance this only added to the constant noise. Re-usable ear plugs are provided next to your bed in an effort to remedy this. I have traveled all over the world and paying upwards of $300.00 a night for a room of this quality is outrageous and a mistake I will not make again. I can likely assure if I was to book directly with the property this would have likely not occurred but a bit more effort on the ownership's behalf would have improved my experience greatly. I am not looking to negatively rate this property but overall guest satisfaction should always be the top priority. Working with and allowing a company such as Booking. Our room(king) size was not clean and needs some real overhaul, remodeling. No parking. Main house AC ran all the time. Shower didnt drain well. Our room (#1, The Tropical Room) was trip-over-your-feet tiny. There was no space for a night stand or reading light on one side of the bed. The bathroom was also tiny with a pedestal sink that wasn't securely attached to the wall. The shower had no grab bar, which is a real safety concern for anyone in their sixties. My husband served as a spotter for my shower. The breakfast was also a disappointment. Nothing special and the breads were super market brand quality. Even the toaster did not work properly. Christina our host is amazing makes you feel so comfortable like you’re at home. The breakfast is fantastic she went to a lot of trouble to make gluten-free things for me the beds are very comfortable pillows are wonderful location is fantastic if you were thinking about this place do it!